HOw do you want to upgrade? Choose between a motherboard / system upgrade or trade in your old key machine for a v4.0 KeyMaster! Keep your current machine and upgrade to our new platform! By upgrading your internals, you will now have access to 4.0 software. Trade your old machine in for the KeyMaster v4.0! Did you know your 10 year old machine still has a trade in value? Its time to trade in your old machine for a 4.0 KeyMaster! Stop wasting time behind a long line of others waiting to get keys. Instead, iLot gives you the ability to perform a transaction and get a key, or a group of keys, all from your mobile device. Whether you are on the lot, or at your desk with a customer, iLot allows many users to access the KeyMaster all at the same time. You now have the ability to track your assets, all via GPS from any user's mobile device. Users can now Geofence individual sections of their lot for organizational purposes, and the app will not only record where each vehicle was last parked, but what specific Geofence it is parked in. Tired spending a full day touching every car on your lot with a pen and piece of paper? 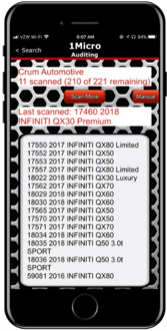 You can now scan 500 cars in 30 minutes using our Inventory Audit Module! Once your Audit is complete, you will have a full report of the cars touched, and what cars are still missing! Multi-user audits that drop a pin of each vehicle location, every time it's scanned! 4K Camera for carousel images and video clips of every transaction. Mobile Label Printer for Vehicle Labels (Auction, Transport, etc). Drawer Layout report and Mass Unassign function (unassign 30 tags in 2 minutes). Cloud-based platform through Amazon Web Services.